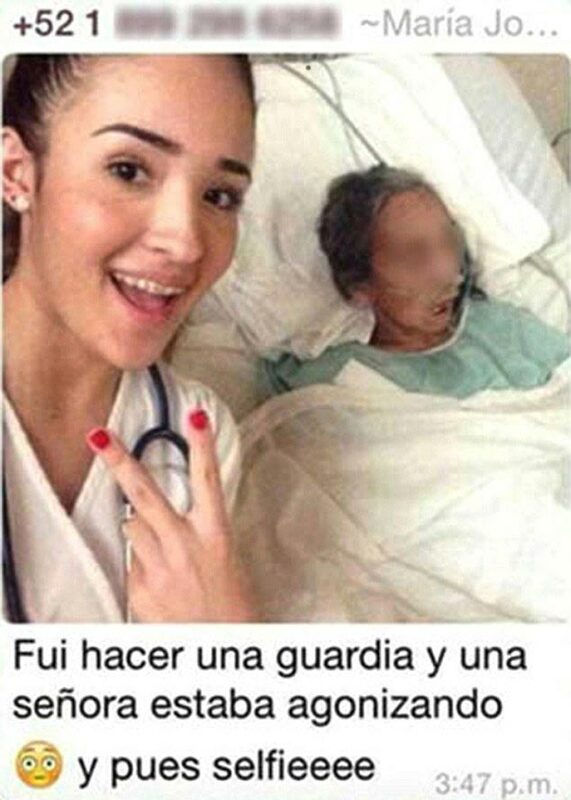 What motivated one medical student to take the above selfie with a dying patient? 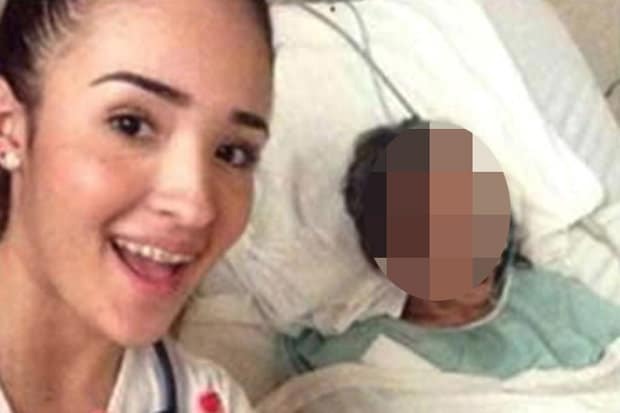 Maria Jose Gonzalez a young Mexican medical student is set to be kicked off her course after taking a selfie of herself smiling next to a seriously ill patient in the town of Tamaulipas. The incredulous photo show the happy go lucky student smiling whilst standing next to a gravely ill patient with a stethoscope around her neck. The photo which was taken in the medical faculty operated by Valle de Mexico University quickly went viral, leading to many condemning the student for her overt insensitivity. That said, the woman according to a report via Mexico’s Proceso Magazine has now claimed in her defense that the picture was taken a while ago and that the patient had given her permission to take the photo. You think? Wrote the medical student on her Facebook page: ‘The picture has been misunderstood, I took it some time ago and yesterday the lady was very sick but I had struck up a rapport with her. Responding to those who insisted that the woman didn’t look like she was in position to agree to anything she said: ‘The lady could not close her mouth it is true because she was sick. ‘I took this picture and more pictures which I have on my computer and I don’t know how this picture ended up being distributed among my friends in which he claimed that she died. But she did not die on shift. It is not true. Since been outed, the medical student has insisted she never took the picture with the intention of harming or making fun of anyone, and whoever stole picture saying: ‘someone with a lot of cheek and she doesn’t like me has tried to harm me but I will prove them wrong’. The University meanwhile has responded to criticism by announcing that there will be full inquiry whilst asserting that the photo ‘did not reflect the values of this institution’. The incident comes after a student obstetrician sparked outrage after posting a picture of himself in front of a woman in labour last month. Daniel Sanchez uploaded the image onto his Instagram page alongside the caption: ‘Lady I can deliver your baby but first let me take a selfie’. Over 5,000 people called for his conduct to be investigated, after the picture – taken at a hospital in Venezuela – was posted online. Similarly in Russia in March, Russian paramedic, Tatiana Kulikova, 25, was fired after a series of photos emerged of her taking pictures with dying patients. Posted the paramedic in one snap, while sticking her finger up at an accident victim, ‘Another moron.’ Indeed. 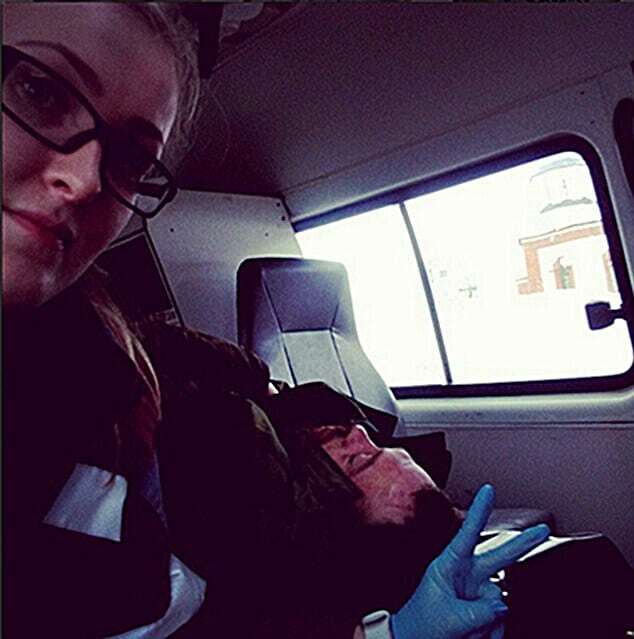 Tatiana Kulikova, a Russian paramedic caused outrage after posting selfies deriding patients. Every one of those sickos should NEVER be allowed to be in the medical profession at ALL. Selfies with vulnerable people is the lowest of the low.